As district leaders prepare for the new school year, "these are the issues that we are really talking about," New Rochelle, NY, Superintendent Brian Osborne said of the results. 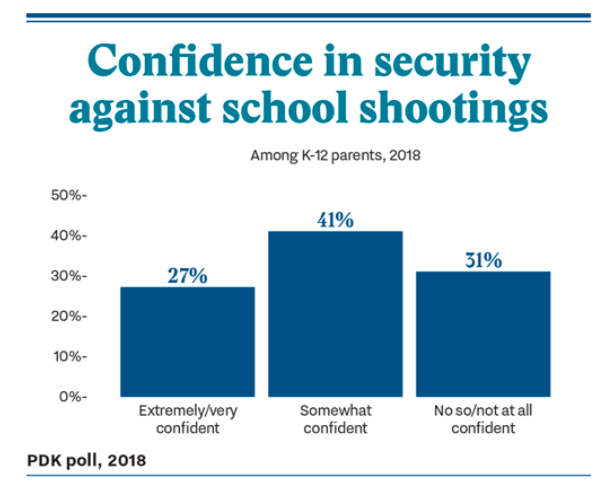 More than a third of parents believe their children are not safe at school, according to the results of this year’s Phi Delta Kappa (PDK) Poll, which surveys members of the public annually on key educational issues. Five years ago, only 12% of respondents said they feared for their children’s safety, while this year — marked by mass school shootings in Florida and Texas — the rate has increased to 34%. Those in households with an annual income of less than $50,000 are twice as likely to say they believe schools aren’t safe. Democrats, nonwhites, women and those in urban areas were also more likely to answer that their children are not safe at school. Gary Langer, the president of Langer Research Associates, which conducted the poll, said on a media call Monday that while responses of over 50% are usually considered more significant, the fact that a third of all parents worry about their children's safety while at school is "an important finding to keep in mind. It's a heck of a lot." The annual PDK poll is typically released in August and covers a wide range of topics related to public schools, including vouchers, diversity, career readiness and measures of school quality. But PDK leaders opted to release the school safety results now "as a contribution to the public discourse on this critical issue” according to the survey report. "Some of our data is so compelling and timely we want to get it out there first," Joshua Starr, CEO of PDK International, said on the call. The results reflect the views of a sample of 1,042 adults, and the respondents included a sample of 515 parents with children in school. The shooting that occurred on May 18 at Santa Fe High School in Texas, in which eight students and two teachers were killed, fell during the window for the online survey, May 1-21. But according to PDK, only 18 of the survey-takers, including nine parents, had not yet completed the survey. The results have a margin of error of 3.9 points for the full sample and 5.5 points for the sample of parents. The survey asked parents: "How confident are you that there is sufficient security against a shooting attack at [his/her/their] school?" Asked about some of the school security solutions being considered by the Federal Commission on School Safety and other state-level groups, only about a quarter of the sample is in favor of allowing teachers and other school staff members to carry weapons, while 36% say such policies would put students in more danger. Arming teachers has become a partisan issue, with support among Republicans at 57% and at only 17% among Democrats. Gun owners are also far more likely than those without a gun in the home to support arming school staff members — 55% compared to 26%. White respondents were also more likely than nonwhite respondents to favor arming educators. More than 80% of both black and Hispanic parents would also prefer their child not be in a classroom with an armed teacher, compared to 57% of white parents. Respondents were more likely to support their child being in a classroom with an armed educator if “rigorous training and screening” — about 80 hours of preparation — were provided. The vast majority of respondents — 80% — support armed officers in schools, with mental health screening (76%) and installing metal detectors at all entrances (74%) also receiving a high level of support. Brian Osborne, superintendent of the New Rochelle City School District in New York, noted on the call that superintendents consider these results in the context of their own local communities. "These are the issues that we are really talking about right now as we prepare for the '18-'19 school year," he said, adding that a major implication is the cost involved in implementing strategies that make schools "impenetrable for those who would do harm" while also making schools feel welcoming for students and families. Voters in his city, he said, recently turned down a budget that included funding for more school psychologists, counselors and social workers, and only approved it when those positions were removed. Meanwhile, his district is delaying some facility improvements in order to cover the costs of security equipment. Officials are also continuing discussions on whether to add a permanent school resource officer at New Rochelle High School, where a student was fatally stabbed in January. The public strongly supports spending money on mental health services in schools more than armed guards. The same holds true across party lines. Democrats, however, are still more likely than independents and Republicans to prefer schools use resources on mental health services than armed guards. Starr acknowledged that survey takers might not distinguish between mental health screening and mental health services, which could include social-emotional learning programs, individual or group counseling, or referrals to community-based mental health providers. The survey uses both terms. "Local communities have to tease some of these differences out," he said. According to a 2017 journal article by researchers at Ohio University and Texas A&M University, screening for social, emotional or behavioral problems occurs in just 2% of schools. Challenges include how to afford such screenings, what procedures or instruments to use, concerns from parents, and how to provide additional services when students need them. And even experts are not in agreement over whether universal screening can prevent school shootings. At the federal commission’s meeting on June 21, L. Rowell Huesmann, a professor at the University of Michigan, said in his comments that screening students for mental health needs is not an effective violence prevention measure. "Particularly important to understand is that the majority of people with mental illness are not violent," the National Association of School Psychologists noted in a February press release. "To conclude that the presence of an issue like depression predisposes someone to commit this type of violence perpetuates an incorrect stereotype and maintains a stigma that often creates a reluctance to seek treatment. Homicidal behaviors are the result of a complex combination and interaction of risk factors that may be environmental, biological, or both." Osborne noted that in his district, teachers have been trained to identify students who may have mental health issues or be prone to violence, but that a formal screening process is not used. He added that in his district and others, student support services, such as counselors, were cut back during the recession and have not been fully restored. In addition, the U.S. Health Resources and Services Administration estimates that by 2025, the shortages of school counselors, psychologists and social workers will reach higher than 10,000, due to school budgets not recovering from the recession as well we fewer college students pursuing those professions. In May, Sen. Bill Nelson, a Democrat from Florida, introduced the Increasing Access to Mental Health in Schools Act, which would create grants to help school and university partners recruit, train and retain mental health providers for schools, establish a loan forgiveness program for professionals working in low-income schools and call for more research on the shortages of these professionals. In testimony before Congress, Sen. Nelson said, "We need to do more to provide students with access to the mental health professionals they need. We must hire more school counselors, social workers, psychologists and other mental health professionals to get ahead of the problem and ensure any student who needs help is able to get it." Osborne added on the call that superintendents will likely follow up with additional surveys to better understand how parents and members of the public feel about these issues. The PDK poll, he said, "gives us a macro view of what’s going on and helps us to define what are the kinds of issues that are playing out even in our local communities."